Twenty-five UCL volunteers have spent their Sundays this month helping to preserve Hinemihi, the only Maori meeting house in the UK. UCL Archaeology masters and PhD students, members of staff and alumni have cleaned carvings, tended the thatched roof and plugged holes in the floor left by animals burrowing in from the surrounding gardens of National Trust property, Clandon Park in Surrey. Their efforts are part of an annual project devised by Dean Sully, a lecturer in conservation at UCL Archaeology and Advisor for the Conservation of Archaeological Artefacts for the National Trust, which acquired the meeting house along with Clandon Park fifty years ago. A small painted wooden building, Hinemihi is not the typical National Trust property. She is one of only four Maori meeting houses outside New Zealand, and the only one in the world not under the care of a museum. Furthermore, for the Maori community, Hinemihi is not only culturally important but an actual living entity, the embodiment of an honoured ancestor. Maintaining Hinemihi to exacting standards while respecting the community's beliefs is just the kind of challenge that UCL prepares students to tackle. "Conservation teaching at the Institute of Archaeology goes beyond the more traditional views of sticking pots together and covering up the cracks," explains Mr Sully, who has coordinated joint National Trust and UCL conservation projects since 2000. "The old certainties of the profession based on an understanding of the material world have been changing towards an engagement with diverse cultural perspectives, to the need to justify the conservation process to a broad range of interested groups." A sympathetic partnership between the National Trust, UCL volunteers and the Maori community has underpinned activities over the past three weeks. Before work commenced, a powhiri (welcoming) took place for those new to Hinemihi, followed by a karakia (blessing) to keep everyone safe during the maintenance activities. Volunteers were careful to approach the meeting house for the first time each day from the front rather than the side, and refrained from eating, drinking or smoking in accordance with the protocol for entering a marae - a Maori meeting ground. 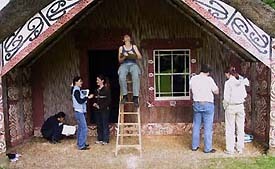 In turn, members of Ngati Ranana (London Maori Group) learned techniques for cleaning delicate painted surfaces. Visitors to the property and volunteers alike gained insights into Maori culture through traditional martial arts training, and watching kohanga reo (the Maori language pre-school) rehearse performances, paint, draw and tell stories. Hinemihi went through many incarnations before resuming her spiritual role. Built in Te Wairoa on North Island, New Zealand in 1880, she survived the 1886 eruption of Mount Tarawera before being bought in 1892 by the fourth Earl of Onslow as a souvenir of his time as Governor of New Zealand, and was transported to Clandon Park to be a summerhouse. After the First World War, Hinemihi became a garden store and after the Second World War a goat house and Wendy house.